Properties in Westward Ho! average 4.6 out of 5 stars. Tides - The LARGEST 2 Bed luxury Apartment within Horizon View! Property 8: Tides - The LARGEST 2 Bed luxury Apartment within Horizon View! Beautiful Sea Front North Devon Apartment with 3 large bedrooms. Sleeps 6. Property 10: Beautiful Sea Front North Devon Apartment with 3 large bedrooms. Sleeps 6. “Penthouse 60” is a Luxury Apartment With Amazing Sea Views In Westward Ho! Property 11: “Penthouse 60” is a Luxury Apartment With Amazing Sea Views In Westward Ho! Contemporary Apartment near the beach with a sea view on North Devon Coast. Property 16: Contemporary Apartment near the beach with a sea view on North Devon Coast. 45 Horizon View - Luxury Apartment with Amazing Sea Views in Westward Ho! 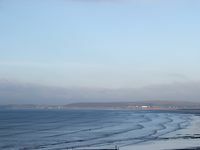 Property 21: 45 Horizon View - Luxury Apartment with Amazing Sea Views in Westward Ho! The perfect Woolacombe Beach studio for couples and small families. Property 22: The perfect Woolacombe Beach studio for couples and small families. 3 Bed Ground floor apertment minutes from the Beach! Property 38: 3 Bed Ground floor apertment minutes from the Beach! Property 42: 3 bedroom accommodation in Westward Ho! As I permanently use a powered wheelchair access is extremely important and this review is from a wheelchair users perspective. A very large and spacious flat with great views of the sea, comfortable beds and a large kitchen. Good wheelchair access from the front but only a pull-in drop-off space for cars and very narrow pavement from the lowered kerb which is some distance away the via road to the entrance. Wheelchair access from the rear (ample) car park was good but fiddly with someone having to access the underground garage area to open the garage door from the inside to allow access (pedestrian doors All have thresholds) Once inside the flat there are wide doorways with ample turning areas. The master bedroom with en suite shower room is NOT accessible to someone in a wheelchair as built in wardrobes are too close to the door way. Access to the second bedroom was very good and easy to negotiate. The main bathroom was easy to access and transfer to bath (bring own bath lift), over bath shower and toilet is relatively easy but there are no grab/hand rails. All in all a very nice comfortable flat.